Heat oven to 375°F. In large bowl, beat 1/2 cup granulated sugar, the brown sugar, peanut butter and vegetable oil spread with electric mixer on low speed until well mixed. Beat in honey and egg until well blended. Beat in remaining ingredients until dough forms. Shape dough into 1 1/4-inch balls. Place balls about 3 inches apart on ungreased cookie sheets. Flatten in crisscross pattern with fork dipped in additional granulated sugar. Bake 7 to 9 minutes or until light golden brown. Cool 1 minute; remove from cookie sheets to cooling rack. Cool completely, about 15 minutes. 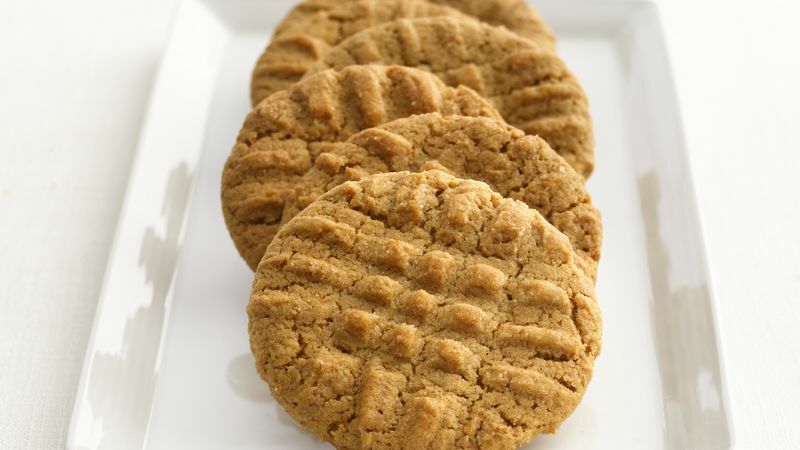 If you want cookies with a little less fat content, you can try reduced-fat peanut butter instead of regular. We tested the recipe with 25% less-fat peanut butter spread and had good results. The honey in this recipe enhances the flavor and cookie texture.